Lead-Free and sold individually or as a set of 6. The 2 1/16 opening seems small, is that an accurate measurement? This is the best glass we've ever had. Highly recommend. We use it everyday ranging from high end wine to box, white/red/sparkling. Thank you for your question, the opening on the Zalto Universal Glass is 2 1/16. BEST ANSWER: Yes, these glasses are called Universal as you can drink both red and white wines out of the glass with nearly the same results as the specialized glass for each varietal. They are made for wine lovers that only have room for one style of glass and they drink big Cabernets and Sauvignon Blanc. I highly recommend these glasses, however, be very careful when you rinse and hand wash them. The Zalto Denk'Art Universal Glass can be used for many different varietals, and you are correct, that is why they are called universal. They are beautiful, elegant and durable glasses which are mouth blown and will enhance your wine drinking experience. Yes. They would be special gift, for sure! I am in the wine business, and I use these exclusively for all the wines I make and drink for pleasure. And don't be fooled by their delicate look - they are very resilient and do well in the dishwasher. Hi Gene. I will defer to New York Times wine writer Eric Asimov. In his wine column "The Pour" appearing in the Times on March 16, 2017 he recommended this glass as excellent for all types of wine. Should be a great gift. These Zalto glasses are the absolute bomb for drinking both whites and reds... They are beautiful in the hand, elegant and surprisingly sturdy. A great gift! That is why, and I have found ours generally excellent for both. I recommend them highly from our experience. We use them for both. We love these glasses however, they are a complete nightmare to clean & polish. Yes. They are great all-purpose glasses. And it's an extremely gracious gift. The glasses are amazing. Yes, we use them for both. Its a beautiful glass and highly rated by sommeliers! Yes, you can use for all including sparkling. We've had 2 of these since July 2018, and we LOVE them. Use them almost every day. But my husband was just handwashing one and the stem snapped in half. Did we do something wrong, or is this indicative of a default in that particular glass? We've planned to buy more, but the fragility concerns us. We have never put them in the dishwasher out of an abundance of caution. So two things. First, when hand washing, it’s important to not hold the glass by the stem. Instead, hold by the base of the bowl, and then use the other hand to wash. Holding by the stem will put too much pressure on any wine glass for washing. Second: for the dishwasher, my main concern hasn’t been residue from soap left in the glass. So I wouldn’t worry about the dish washer from a breaking perspective. I’ve had two different sizes in these glasses for over a year and have never had that problem. I’ve washed by hand and put them in the dishwasher. I love these glasses and will order more. I've broken 3 to date! But I blamed myself for all of them? I'd rather blame the glass. I am having to order two more because these break too easily, IMHO. They are very fragile, but my husband loves this glass. (I drink out of the cheaper ones we own.) I broke one just by washing it with too much pressure. Sigh. What's the best way to clean this fragile art piece? BEST ANSWER: Put them in a dishwasher. Always wash by hand and don't hold on to the base to tightly. When cleaning the rim, gently twist with your hands, not the base. Good luck! Actually, Zalto glasses are made for the dishwasher (which is why I bought their all purpose glasses for cocktails after having broken about a dozen Orrefors in the dishwasher). You may not believe this, but we actually put them in the dishwasher and have never had a problem. I did break a Zalto when hand washing. BEST ANSWER: We thoroughly enjoy these glasses. They go in the dishwasher and come out crystal clear, and have never broken. The glass is very thin which enhances the tasting. We use them regularly in lieu of Burgundy glasses. I use them for many different types of wine. I think I want these glasses as they would be my only set, but the fragility mentioned in some reviews make me nervous. Can somebody please recommend something similar that is stronger or less expensive to replace? 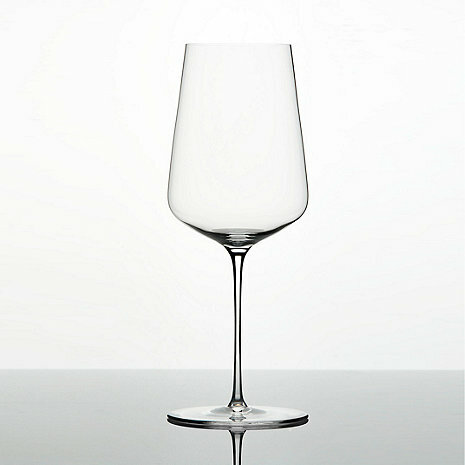 BEST ANSWER: The Zalto Denk'Art Universal Glass is truly luxury stemware. We offer two lines of glassware that both have a 10 year warranty - our Zenology and Fusion lines. These are both elegant and sturdy. I think you will be very happy with the Zenology universal glass. We had same issue with Zalto, loved the design but they were too fragile. Can you tell me the diameter of the base of the glass please? BEST ANSWER: The diameter is 3 and 5/16 inches. Can this glass function as a port glass for vintage port? Is that too universal of a request? BEST ANSWER: The Zalto Denk'Art Universal Glass is designed specifically for Chardonnay, Chianti, and Riesling varietals. Port is served in a small version of a red wine glass, which holds 6½ ounces and is 6 inches high. do you do discounts if i order more than 1? thinking of ordering 4-6 thanks. BEST ANSWER: Zalto glasses do not have multiple glass discounts. Can I order one glass - my 95 year old dad knock it over.... And I need to replace. I recently purchased 16 glasses. Great glass, but fragile. Broke one! Great for big reds, but be careful. They will break easily. I hand wash my Zalto wine glasses and tonight I was drying the glasses after washing them with a hand towel, being extremely careful, the stem broke in my hands...nonsense...this makes no sense. Never again! I absolutely love these glasses! I purchased them as a gift (which I selfishly get to enjoy!) for my significant other who wanted some elegant stemware. To get more "bang for my buck" I wanted something that would look good, but would work for a multitude of varietals. I've enjoyed sweet whites, bold reds, and several varieties in between out of them and these glasses did not dissapoint. They are beautifully made, perfect for swirling and opening up your wine, and shockingly lightweight. The glasses are so light, one would expect them to be extremely delicate, but they're actually quite durable. While the company assures they are dishwasher safe, I still hand wash them (as I do all of my stemware regardless). If I had to find any flaws, it would be that the glass tends to hold finger smudges more than others. Keep your hands on the stem where they belong and you're just fine! In my opinion the best wine glass by far in this price point. I will definitely buy more as needed and very highly recommend them to others. No need to purchase different glasses for each wine unless you want to. These are also dishwasher safe. These are just wonderful wine glasses. The shape and stiletto look is commented on by all that use our glasses. And, I love that they are dishwasher safe without a hitch. As a "universal" glass, this does indeed work well with a variety of different wines, holding its own with an assortment of reds, but really showing its strengths with whites. With several Vouvray, Chenin Blanc and Rieslings, this has outperformed other white-varietal specific glasses we've tried. Looks great in a formal setting when matched up with the Zalto Burgundy glass, as well. This is the most delicate and stunning glass I have owned. The history behind this glass is very interesting and I like the fact that lead oxide is not used in the hand blowing process. The crystal is superb just like its lead counterparts. The price reflects the beauty and uniqueness of such a glass, which makes it difficult to justify purchasing in quantity. My only concern is 1. as the wine glass is very very delicate extreme caution must be used when dishwashing, I make sure NOTHING is close to it in the dishwasher as I feel one nick and the glass may shatter to bits and 2. when there is more than a couple of ounces of wine in the glass I feel that the glass is actually a little unbalanced due to its delicate design. Furthermore, when the wine is swirling around the glass it feels slightly uncontrollable, again due to the delicate design (primarily in the stem). Nevertheless, this glass focuses the aromas very nicely and the delicate nature of this glass makes this easy on the hand and very classy. I love it but this will be my go to tasting glass due to the price rather than a placement at the dinner table when guests are dining. We love using these beautiful wine glasses! However, they are a bit more fragile than I anticipated even after reading other reviews before I bought them. I would not say they are dishwasher safe. We've owned them just a few weeks and already two have broken in our dishwasher. For that reason and the fact that they are expensive I give them four stars. Maybe it's just my dishwasher, we have a drawer type washer not a front load. I only hand wash now, which is fine when it's just the two of us, but becomes a chore when we have guests. With all that said we will replace the broken ones and we do love everything else about them! My wife and I have been looking for great looking for glasses that worked well with pinot noirs to cabs. Lovely stem, very elegant to the point of being overly cautious with it. Appears strudier than it looks, but at $60/stem, still somewhat cautious. But it is beautiful and a pleasure to drink out of. In a Glass of its Own! The Zalto glass is the finest wine glass we have ever used. The Zalto glass will emphasize the lack of quality in a wine. So, if you are serving a lesser wine we suggest that you use a different glass. THE BEST FOR AROMA , TASTE AND THE FEEL IN MY HAND. I HAVE HAD 2 FOR A YEAR AND THEN I ORDERED 4 MORE. My son loves these glasses. but handle with care ! I touched one gently and it tumbled and broke. I think they break too easily. I had it only a few days. This glass is very delicate yet sturdy. I love the way wine tastes and because it is universal, the wine presents well regardless of its style. My only complaint about this glass is all the other wine glasses I now use feel clunky and grotesque now. This glass is so thin and light, you're right up against the wine. Somehow it pulls this off without feeling delicate. Just wonderful. I love drinking wine out of these. Worth the insane cost. We love our Zalto wine glasses! They are light, delicate & have a great style! For one of the wines, they brought our our glasses first. We picked them up and when the wine arrived, all we wanted to know about were the glasses. They are eerily light and elegant. They make whatever you are drinking seem more decadent. Pricy yes, but if you really want to show off a wine, this is the way to go! I love these glasses. They are so delicate - yet hold up well to regular use. The stem is actually slightly flexible. After buying two of 3 different sizes for myself, I've now started sending them as gifts to the wine lovers on my lists. Feels good in your hand, at the lip and looks fine on the shelf. I want more. Upon opening the box, I got chills and teared up from the beauty. The Universal glass is functional art. For me, the wine glass is an extension of the wine experience. Beautiful wine meets worthy container. I adore how lightweight it is! It's as though you can sense the wine through the glass instead of the glass being a barrier or a distraction. The philosophy of Zalto using the angles of the Earth to form the stemware resonates with me deeply and interacts with the display of the wine. I've served both champagne and Cabernet and both were showcased beautifully. This glass has caused me to slow down and deepen my wine appreciation and experience. Kisses to Zalto! From the moment I held this glass, I knew I had to have them. They are so light, delicate and feels wonderful just holding in your hand. Crazy, I know, but makes my wine taste better and smell better. Perfect wine glass in every way. Expensive but worth the price if you want to drink good wine out of great glasses! I did a side-by-side comparison with my current wine glasses and it’s clear Zalto knows what they’re doing. More aroma and better tasting wine! Awesome glasses. They feel so perfect in one's hand. Definitely added a very nice extra touch to drinking wine. perfect for every type of wine. great feeling in hand. I bought these glasses for a friend's wedding gift. Although I have not used them, the recipients have told me that they are beautiful and that they use them every day. Highly recommended by a sommelier! I bought these beautiful glasses for my son and his wife for Christmas because my brother met a sommelier that highly recommended them, suggesting that that they really do make your glass of wine taste better than a different type of glass. My kids say they love them, and love the design and the hold. I ordered these for my son after we were served in them at a wine tasting in Sonoma. They were his request for Christmas present. He loves them! Thumbs up for the Universal. The Universal is really a fine wine glass that does satisfy both reds and whites. If you're a purist you may struggle a bit with either but my wife and I have been very pleased. We will likely add to our wine glass collection with more Universals rather than go to greater specificity with the other models. The feel and function of these glasses is excellent. One review commented that they are fragile and one that they are sturdy. I doubt they are both. It's best not to drop them in the sink (not the voice of experience yet) but they can survive a civil clink for a toast without causing any anguish. Recommended. I have used Lenox and Riedel for years but finally decided to give Zalto a try after seeing all of the accolades MS's and MW's give this stemware producer. Remarkably light, yet durable; gorgeous design, yet simple; provides an excellent vessel to drink wine from and yes, this quality gives even the most simple of wines an elegance that will shock you. That is what the power of high quality craftsmanship can do. This was a gift to our son, who is a wine enthusiast. He even makes his own wines. Lasjaraswines.com. He maintains that the quality, shape, material, and design contribute to bringing the best of every wine to one’s lips. "Buon vino é un grande piacere": (Good wine is a great pleasure) Good wine in a Denk'Art Glass is a greater pleasure. They are so light and "transparent" that nothing seems to intervene between the wine and me. Very elegant, beautiful glassware. These glasses are very thin and lightweight. They look fragile, let's hope they are not. Just the right size for an average pour. Glasses do make a difference! These are great for the Alsace whites. Hold by the upper stems as they are super delicate but worth the attention. Easy to clean. A must for folks into wine or those who are skeptical that glasses will make a difference. These glasses greatly enhance the flavors of wine. I compared Joel Gott cabernet in my regular glass with the Zalto glass, and my wife an I could not believe the difference. The wine in the Zalto glass tasted so much better that it was hard to believe it was the same wine. I plan to order more Zalto glasses. Fantastic glasses. Nothing else to be said. Plain and simple one of the best if not the best. Have used many of the best known glasses but Zalt stands out. If you can affort them get them especially the universal. Great wine glass, highly recommended. The glasses are extremely light and balanced. The shape of the glass enhances the aromas of the wine. The mouthfeel of the glass enhances the flavor of the wine.